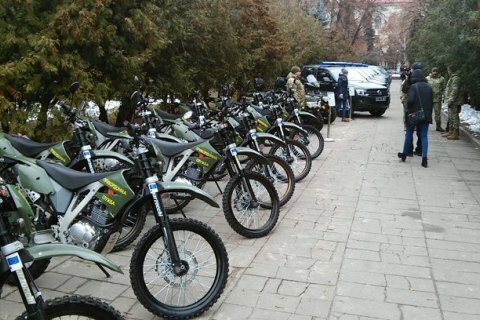 The Border Guard Service received 25 new off-road vehicles, 45 motorcycles and 10 quads. The Delegation of the European Union to Ukraine on Tuesday handed over to the State Border Service of Ukraine technical equipment and vehicles worth 2.2m euros to strengthen the country's border with Belarus. The State Border Guard Service said in a report on 22 November that the technical assistance is part of the second phase of the international project SURCAP aimed to strengthen the capacity of the border agencies of Ukraine and Belarus to protect the common border. The project is funded by the European Union and implemented by the International Organization for Migration. In particular, Ukraine received 25 all-terrain vehicles Volkswagen Amarok Pickup Trendline; 6 minibuses Volkswagen T6 Kombi; 45 motorcycles Enduro PR4; 10 quadrocycles Outlander L Max 570 DPS; 30 thermal imaging binoculars Archer TGX-8/75-640; 4 sets of wireless detection system Defendec; 66 pairs of cross country skies Elan 'Himalaya'. The ceremony was held in Zhytomyr. The second stage of the EU-funded regional project “Strengthening Surveillance and Bilateral Coordination Capacity Along the Common Border Between Belarus and Ukraine” started in April 2014. The total budget of the project is 5.350m euros for two countries in equal proportions. The project is co-funded by the Ministry of Foreign Affairs of Romania, IOM, and border agencies of Ukraine and Belarus. In October, the European Union gave the State Border Committee of Belarus machinery and equipment worth over 2m euros for the protection of the Belarusian-Ukrainian border.